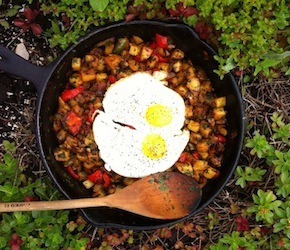 Making a hash while camping is a great way to get a hearty breakfast in before a day of activities and it’s also a great way to use up leftovers from the night before. Here is a simple recipe using some of the staple spices and ingredients I always have on hand while camping. Dice onions, peppers and finely chop garlic cloves. Using a large cast iron pan add olive oil and sauté onions, peppers and garlic for about 2 min. Add paprika, thyme, chili flakes, and cumin, sauté for 30 seconds. Dice the potatoes in to 1 cm cubes. Combine any remaining leftovers you may have from the night before (steak, hamburger, sausages) and add it to the pan along with the potatoes, sauté until the potatoes are tender. Recipe provided by Executive Chef John Robertson – avid camper!